The Avon was the first axial flow jet engine designed and produced by Rolls-Royce. Development started as early as 1945 as a potential replacement for the Nene engine, with the prototypes being built in 1947 and finally production in 1950. 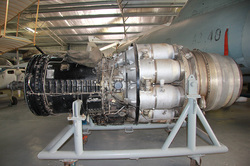 The engine went on to become one of Rolls Royce's most successful post-World War II engine designs. It was used in a wide variety of aircraft, including the English Electric Canberra and also the Museums' CAC Sabre as well as versions for stationary and maritime power. Production of the Avon aero engine version ended after 24 years in 1974.